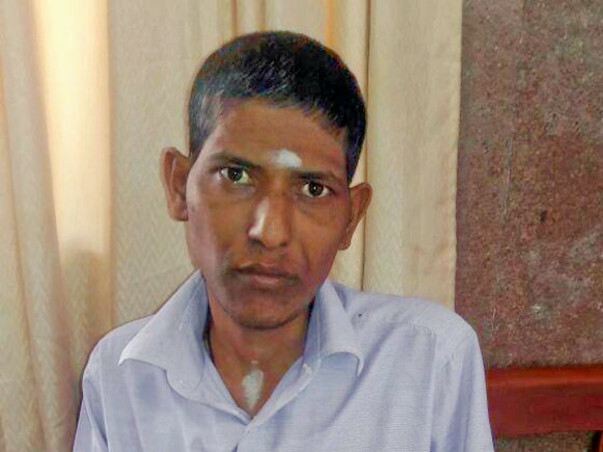 33 year old Jayachandran has a liver failure. He was a teacher at ITI School for the past 9 years. Due to the severity of his health condition he is unable to carry on with his work. He had undergone a liver transplant at Apollo Hospitals, Chennai. S. Jayachandran and his wife Susheela have two children, Dhanalakshmi and Omesh, age 7 and 4. Susheela is a housewife. In the year of 2014, patient has had severe stomach pain and was taken to kancheepuram. It was identified that the patient has hepatitis B. Treatment was given for a year in Ramachandra hospital. He later continued to have severe stomach pain and was asked to go to Global Hospital. They even tried ayurvedic treatment for 6 months. He was taken to GH and then Stanley for a month for further treatment. Later they were referred to Apollo hospitals, Chennai. The family is from an underprivileged background. Doctors had examined S. Jayachandran and advised Liver transplantation. This is to be done in Apollo Hospitals, Greams road, Chennai. The family has spent so much on treatment and travel as they live in a village called Ramanujapuram near Kancheepuram. The surgery costs has been taken care of through the CM funds. 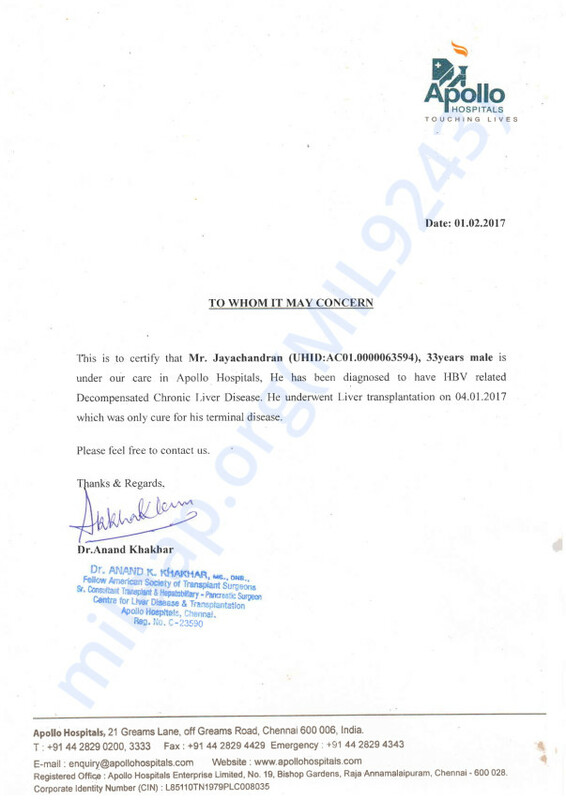 Jayachandran underwent transplant on 4th Ferbruary. The patient needs help with further treatment for his Kidney stones and immuno suppressants. The family needs 7.8 lakhs for the treatment. With no income in the family, they are not able to go further with the liver transplant unless they get the required help. We have some good news to share with you on Jayachandran's health. Jayachandran has been discharged from the hospital and is doing well now. The liver transplant was successful and he was on medications initially for it and also for immunosuppressants. He now has to visit the hospital once or twice a month for a general check up but is recovering at a good pace. Thank you all for the love and support. This would not have been possible without your help. Blessings be upon you and your family. Be strong and stay positive, and may your family have the strength and all will be better.